Domestic appliances are expensive and, when they break, are liable to cause catastrophe. But it doesn’t need to be that way. The Popular Mechanics editorial team are on hand to deliver the best buying advice. Let’s start with the washing machine. No, you haven’t slipped through a wormhole into next month’s issue of Home Appliance Monthly. But what you are about to read is recognition that the Popular Mechanics reader is concerned about more than just how to fix a stubbornly non-washing machine. In any case, today’s high-tech machines are as different from their predecessors of only a few decades ago as the Millenium Falcon is from the horseless buggy. We’re headlining this foray into the world of big metal-and-plastic boxes The Grudge Report, because nobody really wants them, even though everybody needs them. Particularly if the current one has expired in a flood of curses, tears, sudsy water and half-done washing. Here’s the thing: there’s something strangely compelling about the modern take on what is, when all’s said and done, a humble labour-saving device. Besides ensuring the whitest whites, darkest darks and brightest colours, they – and we know this is hard to believe – can also save you money. Plus, they’re smarter than you think. Although perhaps not smart enough to stop you turning your favourite woollen socks into baby booties, if you don’t bother to read the care instructions. Why? Two things. One is the direct drive inverter (variable frequency) motor. Two is the TrueSteam function. Inverter motors can change frequency and direction; this can greatly reduce power savings and optimise washing cycles for various cleaning applications. The inverter motor can also throttle up in short bursts for speedier rinse cycles, which will also cut down on water use. According to affinity laws defining the relationship between centrifugal load variables, power consumption can be as little as 25 per cent of what is needed to run the motor at full speed if you throttle down to around 60 per cent. Also cutting down on water use is the TrueSteam, which can heat up small amounts of water to steam clean tough stains or delicate garments. You can even use this setting to refresh harder-wearing fabrics such as denim jeans and cut down on washing loads. Think of the digital inverter motor as the accelerator pedal on a car. The drum is perfectly capable of spinning on momentum, with the motor mainly used to increase speed. This intermittent and variable power delivery means that the motor is idle for periods, saving on electricity use. There’s also freedom for the motor to spin in an opposing direction, or switch between directions, which results in more variation in wash motion. What makes an efficient machine? Achieving clothes washing nirvana is treading the narrow line between water and electricity savings. The faster you wash, the less water you’ll use, but it costs more energy to get the drum up to speed. Then you also need to factor in the size of the load. Less laundry uses less everything. Where Samsung excels in using laundry detergent with its Eco Bubble technology, LG has spent more time optimising the way the laundry tumbles around the drum. These six motions include scrub, filtration, swing, rolling, stepping and tumbling. The caveat being that you need to spend a bit more time learning when to use which washing technique. 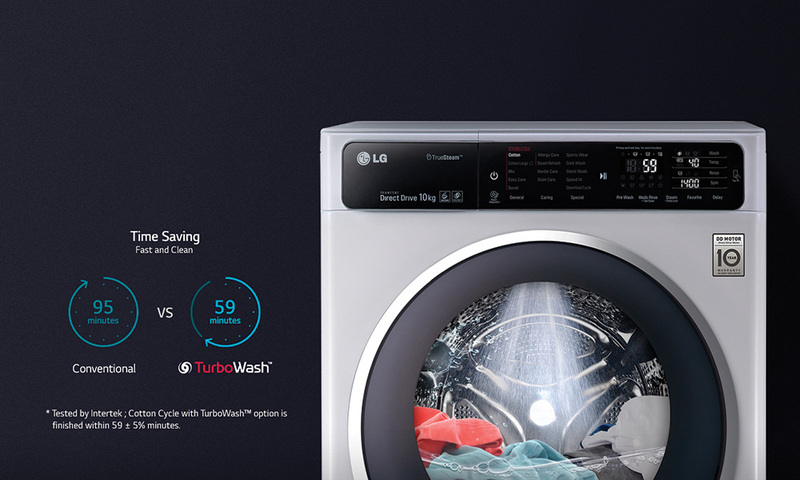 You can then also download other wash cycles via LG’s SmartThinq smarthome platform. Washing machines that can automatically weigh the load fare much better than less intelligent units because they can adjust the resource use accordingly. 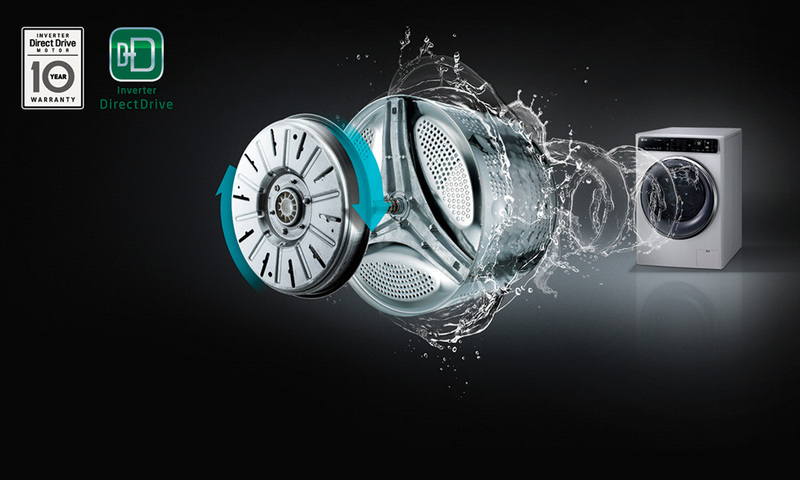 With the machine at the helm in figuring out wash cycle length, water savings of up to 45 per cent can be expected, especially with the TurboWash engaged – bringing the cycle time down to one hour. Test notes: The washing machine was put to work servicing a household of five adults (three women, two men) and two children (aged 6 and 2). This house usually relies on a Defy 15 kg top loader with washing happening twice a week, on average. 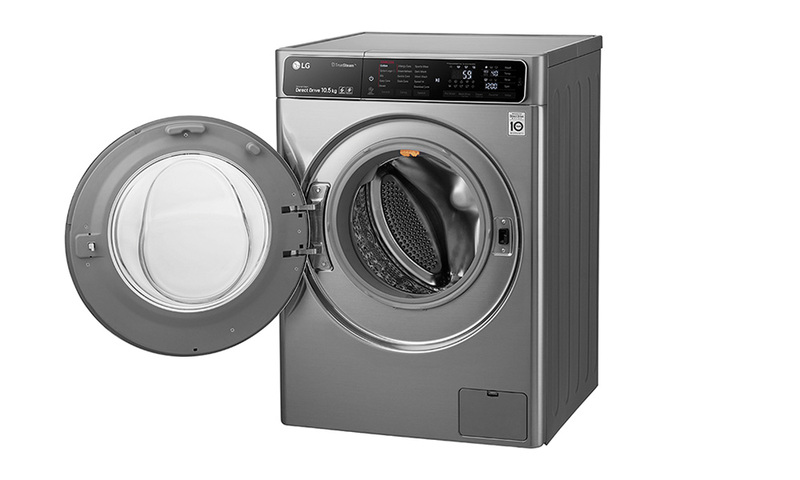 Because the LG unit operates remarkably quietly when compared with the existing top loader, wash cycles could be left overnight. After a month of testing the water bill increased by R100, while there was no significant change to electricity consumption. Wash frequency almost doubled because of the decrease in machine capacity, combined with the extra care taken to optimise load contents. Spin dry was a significant step up from the experience in the Defy machine, but that unit is also 20 years old. A smaller machine for a family accustomed to laundromat-style top loaders made for a steep learning curve and wasted water early on. The machine’s water heating abilities make for a negligible extra draw on the electricity supply. Silent wash cycles mean that wash cycles can happen overnight, outside of peak use times. The spin dry capabilities are excellent. Shorter rinse cycles = less water use. TrueSteam is great for refreshing denim jeans between washes, extending the wear time to almost three weeks on one pair – car grease cut the wear time short. Users remarked that clothes were cleaner and fresher after being washed in the LG machine. LG matches the industry standard of an inverter motor backed by a 10 year warranty, but falls behind with regard to after sales support. Its main competitor Samsung has more brand stores that you can visit should you have a problem. 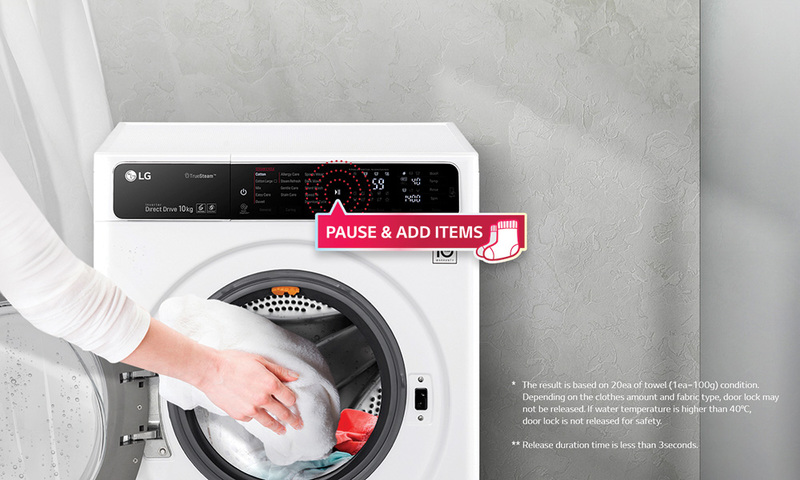 LG does, however, offer the largest number of features when it comes to the actual wash cycles. TrueSteam counts as a big win for the company and there is a bigger emphasis on the physical clothes cleaning through proven varied agitation. If you’re buying a new washing machine, consider a front loader instead of a top loader. Front loaders use around half the amount of water. Look for models with load sensing technology. The machine will adjust the amount of water it uses according to load size. If machine doesn’t have load sensing technology, wash only full loads. Use cold wash wherever possible. Cold wash is sufficient for lightly soiled clothes and is ideal for brightly coloured clothing. Warm or hot water will be necessary for heavily soiled clothing. When buying a washing machine, ensure you choose the right size. A larger machine than necessary will cost you considerably in water and electricity.